Dana came up with an ingenious way to keep the dirty cups from piling up this summer. 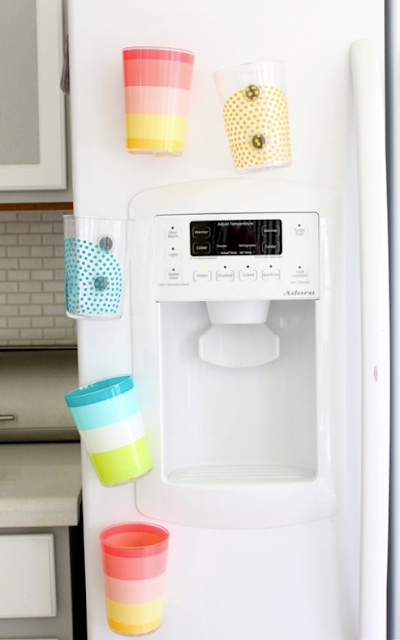 She created these fridge magnet cups for everyone in her family, so not only do you have a designated cup to reuse, but you should always be able to find it in a handy place. And the idea is so fun, the kids might actually leave it on the fridge like they are supposed to! You can check out how to make your own set of DIY fridge magnet cups over at Made. What a great idea! And just in time for the season when the kids are constantly thirsty, and going through eight cups a day. Each.